Towel There are 3 products. 100% terry cotton towel 50x90 cm special hairdressers and beauty, grey. This towel often resistant to aggressive products, which are used in the world of hairdressers and beauty. The terry towel avoids clashes. Practice maintenance : dyes do not remain on the towel after washing. Possibility to wash with hydrogen peroxide. Washable at 90°C as possible. 100% terry cotton towel 50x80 cm special hairdressers and beauty, white. 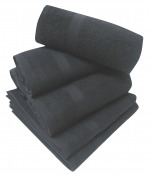 This towel often resistant to aggressive products, which are used in the world of hairdressers and beauty. The terry towel avoids clashes. 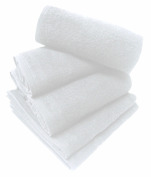 Practice maintenance : dyes do not remain on the towel after washing. Possibility to wash with hydrogen peroxide. Washable at 95°C as possible. 100% terry cotton towel 50x80 cm special hairdressers and beauty, black. This towel often resistant to aggressive products, which are used in the world of hairdressers and beauty. The terry towel avoids clashes. Practice maintenance : dyes do not remain on the towel after washing. Possibility to wash with hydrogen peroxide. Washable at 95°C as possible.